Their concert appearances include the Utrecht Early Music and the Maastricht Musica Sacra Festivals, Regensburg’s Tage Alter Musik, the Flanders Festivals of Gent and Brussels, Le Donne in Musica, Rome; Jordan Hall, Boston; Hildegard von Bingen Symposium at the, University of Oregon, Eugene; Kalamazoo Medieval Conference, MI; Frick Collection and Rockefeller University, NY; Harvard U., Da Camera of Houston; Early Music Concert Series, Boulder; Denver’s Newman Performing Arts Center; Da Camera Society LA; Stanford U., Museum Concert, Cleveland, festivals in Ottawa and Montreal, and many others. In the fall of 2008, the ensemble toured Latvia and also performed at the Moscow Conservatory. Recent performances include American Dreams the Library of Congress and New York City’s Frick Collection and Between Heaven and Hell at the Bucerius Foundation in Hamburg which was broadcast by the Norddeutscher Radio. The ensemble was founded in 1995 at the Longy School of Music and is in residence at First Church Congregational in Cambridge MA. Tapestry is represented by Shupp Artists Management. Laurie Monahan, mezzo-soprano, co-founded Ensemble Project Ars Nova (P.A.N. ), and also appeared with Sequentia for many years. She recently performed and recorded the Messegerio and Musica roles in Monteverdi’s Orfeo with Aston Magna. Laurie worked with the Studio der Fr・en Musik at the Schola Cantorum in Basel, Switzerland and teaches in the Early Music Department at the Longy School of Music in Cambridge, MA. Cristi Catt, soprano, has performed with leading early music groups including Ensemble PAN, Revels, Boston Camerata and La Donne Musicale. As a result of her interest in the meeting points between medieval and folk traditions, she is a co-founder of medieval/world music ensemble HourGlass, and also appears with Le Bon Vent and Balmus. She also teaches at the Longy School of Music. Daniela ToŠiĆ, mezzo-soprano, a native of Belgrade, Yugoslavia toured with the Belgrade-based ensemble Renaissance throughout the former Yugoslavia. In the Boston area she has worked with Ensemble P.A.N., Revels, Zamir, Jubal’s Lyre, La Donna Musicale, Balmus and The Blue Heron Renaissance Choir. 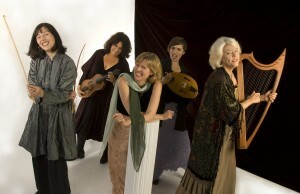 She is a founding member of medieval world fusion ensemble HourGlass and guest teacher for Longy’s Medieval Institute. Diana Brewer performs regularly as a singer and baroque string player, appearing with the Arcadia Players, Boston’s Handel and Haydn Society, Amor Artis Baroque Orchestra of New York, Schola Cantorum of Boston. She is a founding member of Ensemble Ecclesia and Foundling, a Baroque orchestra and women’s advocacy group based in Providence, RI. Takaaki Masuko, percussionist, has performed with a diverse group of music ensembles including Les Miserables Brass Band, and The Horse Flies. He collaborates regularly with various dance, theatre and multimedia projects and is a co-founder of Sabana Blanca, a group specializing in silent film accompaniment. He is a co-founder of HourGlass and serves on the faculty of the Longy School of Music.